vSphere 6.7 was released several months ago, and I’ve been meaning to upgrade my homelab for a while now. vSphere 6.5 has been pretty rock-solid, but it’s time for me to keep up with the Joneses. This post covers my upgrade process and experiences. My original vCenter server was built straight on to version 6.5 when that first launched, way back when. In theory there was nothing wrong with it, except for a deployment decision that I was no longer happy with. When I deployed my vCenter previously, I configured it with an external Platform Services Controller (PSC) as I wanted to mess about with load balancing PSCs at the time. The messing around didn’t take long and I moved on to other things. Problem is, you cannot (currently) go from an external PSC to an embedded one and the external PSC was an extra piece of complexity that I just didn’t need anymore. That pretty much left me with one option: migrate to a new vCenter. Deploying vCenter is a doddle, and I won’t cover how that works. What I will mention though is how I moved my hosts and VMs across. The first step was to liberate one of my 6.5 ESXi hosts from the original cluster and add it to the new vCenter. At this time, I didn’t upgrade the host itself to 6.7 for reasons that will be apparent in a minute or two. Secondly, I went through the VMs that I had registered in my original vCenter and weighed up whether or not I still needed them. Things like old distributed vRA deployments to a quick trip to the virtual bin, other things like AD, jumphosts, remote access solutions etc were powered down and removed from the inventory before being re-added to the new vCenter. Before long, there wasn’t much left and what little is left will probably be left idle for a couple of weeks before I bin it completely. A colleague of mine was working with a customer recently on some changes to their automated VM provisioning process (they’re not vRA customers… yet). He got stuck trying to get around a particular challenge with the automatic naming of network interfaces in certain Linux distributions. The customer in question is using vRealize Orchestrator (vRO) to create (not clone) their Virtual Machines from a JSON structure that is supplied by an external system. In that structure there are definitions for the hardware, OS network identity (name, IP etc) and OS installation sources (ISO file for installation and floppy image for a ks.cfg (KickStart) file). Once the JSON object is provided to the vRO workflow, the VM is created, booted and automatically starts to install and configure itself. Simple VMs have a number of disks defined (for root, opt, var, swap etc partitions) that are attached to a single ParaVirtual SCSI adapter. The VM is also equipped with a single VMXNET3 network adapter. In this configuration, there is no problem. The installation of the OS runs through to completion and the VM is handed off to Puppet and eventually goes in to service. Forbes Guthrie and Scott Lowe have been busy. I very much enjoyed the first edition of the VMware vSphere Design book and now the second edition is up on Amazon for download in Kindle format or pre-order for print copies. In this edition, there’s also a chapter on vCloud design by Kendrick Coleman. Besides being a good read in and of itself, the first book was good to help with VCAP4-DCD preparation. I imagine that this edition will be equally useful for VCAP5-DCD preparation. I look forward to reading it. Well, I will when my copy shows up (family rule: I’m not allowed to buy anything for myself in the month of my birthday). In a lab environment, sometimes anything can go. Solutions aren’t always standards compliant or don’t always follow best / sensible practices. One that I can’t shake off though is using separate drives in my VMs for operating systems and data. It’s too ingrained. Given my new found penchant for using Windows 2008 R2 Server Core for VMs in my lab though I hit a little niggle that I thought I ought to note down for when I inevitably forget about it. When deploying a VM from a template for a specific purpose, it’s natural to add extra disks to it. In the normal version of windows, using the DiskManagement snapin to bring the disk online automatically makes it read-write as well. In Server Core, you can’t use the snapin locally. Firewalls permitting, you should be able to use it remotely (via RSAT tools installed on another machine) but if you’re in a hurry and comfortable with DISKPART then you might be tempted to use that. And that’s where the niggle is. In DISKPART when you online a new disk, it changes the disk’s state but not whether it is read-only or read-write. And you can’t create a partition on a readonly disk! So, what do you do? It’s just a couple of extra steps really. 1. In the command prompt window on the VM’s console, start up DISKPART. You notice that Disk 1 is 100% free but Offline. 3. Next we select that disk and then turn it Online. If you tried to create a partition now you’d get a fairly non-specific error. 4. Look at the disk’s detail and you see why though. “Current Read-only State: Yes”, not the clearest way of saying it but the disk is read-only at present. 5. To make the disk writable you need only type ATTRIBUTE DISK CLEAR READONLY. Now you can create a partition as you normally would. I’ve been a big fan of Trainsignal’s courses for some time now. You never forget your first one and for me that was “VMware vSphere Pro Series Training Vol1”. Time has flown by though. Trainsignal have since released a number of new courses, several of them VMware focused. I have some of them in my library and there are also some that I couldn’t justify purchasing at the time. With all of the changes in vSphere 5 I thought it a good idea to get hold of Trainsignal’s latest and greatest as part of my VCP5 preparations. I’ve done a fair bit of work with vSphere 5 but there were always going to be bits that I was less familiar with. What the training offers is the opportunity to bone up on those weaker areas and brush up on the bits that you’re more familiar with already courtesy of two knowledgable and well-informed virtualisation experts: David Davis and Elias Khnaser. The training comes on 3 DVDs containing a series of screencast videos covering all of the content but there’s also the ability to watch the videos online if you want. At its simplest you can just pop one of the DVDs into your laptop and get started or there are iPod optimised copies also available for importing into iTunes. Pulling your iPhone out of your pocket on the tube in London and learning about VMware Data Recovery is almost priceless as the time would be otherwise wasted. 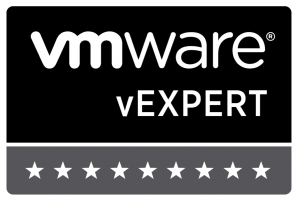 That said, it’s an excellent place to start building or refresh your knowledge and I’d totally recommend the course to almost anyone with an interest in vSphere 5. It’s not without its flaws, I spotted one or two typos and sometimes a iPhone isn’t the best device on which to see large and detailed captures of the vSphere Client! Also, there were some very minor inconsistencies between different videos but these were when opinions were being offered and were not related to factual content. Not something that concerned me, I just picked it up. Overall an excellent resource. Hats off to Elias, David and the Trainsignal team. The rumours were about last week of a change to VMware’s controversial licensing model for vSphere 5 and last night those rumours turned out to be true. The furore that erupted from some quarters was never going to pass the software giant by completely, and kudos to VMware they’ve gone and done something about it. To adjust (increase) the vRAM entitlements for all editions of vSphere 5. To introduce a cap on the vRAM for any single VM to 96GB so even the biggest VMs will only ever need a 96GB VRAM entitlement, even the ones upto 1TB in size! To charge based on a 12 month average usage rather than for peak usage. The question is, will this make a difference? The feedback that I’ve seen so far has been mixed but mostly positive. The increase in vRAM entitlements seems to be the most talked about change and it will inevitably benefit a number (but not all) of VMware’s customers who found themselves on the expensive side of a vSphere upgrade. There have been some naysayers though and a few FUD slingers too. My opinion is that it’s definitely a step in the right direction. Some may feel that they haven’t gone far enough but I think that VMware will be keeping a close eye on this issue and could change licensing again if they need to. I think that the debate over entitlement levels is over for now. Rightly, there will be some continuing debate over whether vRAM is the right model to adopt but I for one want to move on and focus on the technology now.